When *I* was a seminary student . . . Walk down the hallway of a classroom building here at Concordia Seminary. Listen in to what is going on the classroom. Peek in a door, try to find the professor. Chances are, he won’t be standing rock-still behind a podium, eyes glued to some yellowing notes. The students will not be slumped over, head lazily propped up by one arm, the other arm transcribing the inscrutable wisdom thrown down from on high. Maybe this is how you remember seminary. Some days were like that for me — I didn’t have Jim Voelz throwing weasels around the room, I learned my Greek before coming to the sem. Back in the day, theological education was a matter of transmitted information. While Luther lectured his students dutifully penned his words into their notebooks, and a few subsequently published these notes as Luther’s works. Some 300 years later, C. F. W. Walther, founder of Concordia Seminary, probably did much the same thing. His influential Law and Gospel is not a work that he penned, but student transcriptions of his lectures. I came along to Concordia shortly before the graduation count had reached 10,000 students in its history. But, I must say, many of classes functioned in much the same way they did in Walther’s day. Yes, some profs pulled out batches of overheads (remember those? ), and Dr. Nagel needed neither note nor lectern nor outline nor goal (to the delight of some, and frustration of others). But most class sessions provided information, which we then tried to reproduce for the exams. Perhaps it is not surprising that many pastors adopted similar pedagogical practices in their parish ministry. My wife’s catechism has underlined text on each page — the pastor’s instruction consisted (from what she recalls) in directing the students to underline certain key words and phrases. But walk down the hallway of a classroom today. The furniture probably hasn’t changed much over the last 30-some years — in fact, the same desk you sat in is almost certainly still in the same room. But you probably will not find a lecturer standing behind the podium, which may well be shoved off the side. The focus will not be on the lecturer, but most likely on a screen, which might be displaying text, images, or video. Most students won’t be scrambling to scribble down the declamations of the doctor, nor are they snapping keys off their laptops in trying to keep up. Many, most, hopefully all will be thinking, pondering, connecting. It is not that “data” and “information” does not matter — of course our theology has its foundation in “the things have been accomplished among us” (Luke 1:1). But having the book on your shelf, or the information in your files, or the bits and bytes successfully saved on your hard drive is not enough. Engaging with the information, struggling to fit it into what we already know — or thought we knew, developing ways of expressing that theology in words that we can understand — and make understandable to others — these things are happening as I walk down the hallway. And laughter, and sometimes heated debate. Learning theology is not merely getting information, whether from a book, or a video, or a podcast. These help, they can move the process along, save classroom time. But learning theology happens together, in the give and take, in the classroom, down at Kaldi, sometimes over a beer or a Bordeaux. Truth in advertising: I did come across Paul Raabe this morning, standing behind a lectern. He claims that he was giving a test that day. Usually he is flamboyant and quite engaging. Those of us who are here every day can forget how different the “seminary experience” is today than it was when we were students. Much more so with those who graduated a quarter-century ago but haven’t been here lately. When people in the church comment on “the seminaries” as a contrast to “real life” they are almost always reacting to what they remember seminary was like, not to what the seminary is like today. I hope pastors, DPs, and executives will consider this an open invitation to come back, go to some classes, hang out in the Wartburg Commons, get re-acquainted with your seminary. Having now been out of seminary and serving a parish for nearly five years, I find it interesting how the more recent students speak of their professors with a genuine fondness and admiration. I don’t hear that from brother pastors who are farther removed from their seminary days. 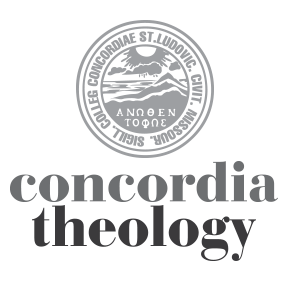 Many of those who taught my classes are men who I now greatly value for not only their teaching ability, but for exuding a deep love for Lutheran theology–and especially for our Lord Jesus Christ. Great post, Dr. Kloha…I remain proud to call myself a St. Louis grad and am also proud of the great work that continues to come out of both our seminaries. The Lord richly bless the work of you and your fellow faculty members as you prepare workers for the harvest fields!